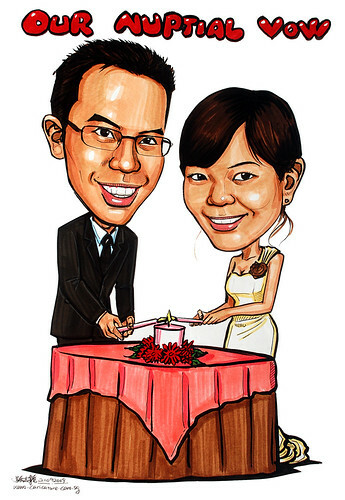 I would like to have a colour marker caricature (with theme) of me and my fiance that will be used for my ROM - A3 size preferred. 1) FH and i will be lighting the unity candles (not doing in pavilion anymore, juz clear background will do as i cant find a nice pavillion or wedding arch image) - the pose will be similar to [lightingunity.JPG]. 4) the unity candles will be in light pink and surrounded with flowers. [unitycandle.JPG] the candles we are holding have to be matching colours. i hope this is not too confusing. :) "
"Thanks for e hard work! It looks great. :) will look for u again for my actual day wedding. - jeraldine"